Having previously developed the successful STRIDE adaptive system for LTS Education Systems, we were asked to develop F.A.S.T. 360, their next generation adaptive engine. Faster than any other adaptive product in the industry, F.A.S.T. 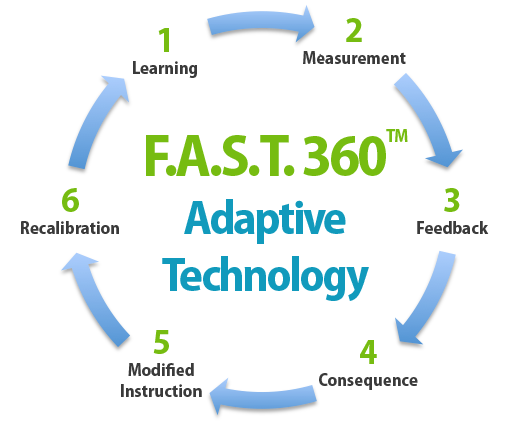 360 (Foundational Adaptive Skill-Building Technology) goes immediately to the core root of the issue for the student, diagnosing areas of weakness — the exact foundational skills that need improvement — which need to be mastered before the student can persist in more challenging work to make it up to grade level. It is diagnostic from the very first student session. It works more efficiently than any other adaptive program. It unpacks each standard into foundational skills, so intervention is fine-tuned at the skill level — not by the overall strand for a skill, as other adaptive programs do. It has the ability to integrate with test results data from third-party assessments.